With all around him still going bonkers, Kyle Hayes slopes off to a quiet part of the Citywest Hotel to soak it all in by himself. 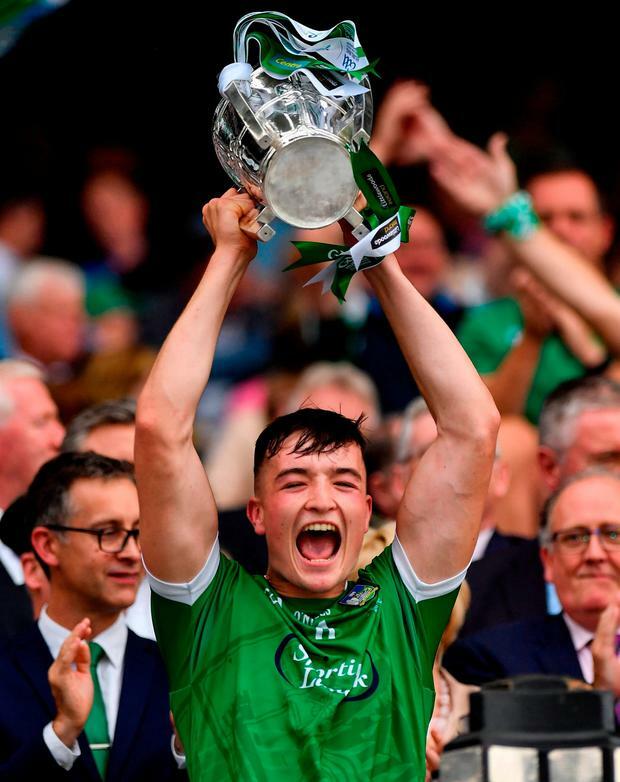 He’s not long back from the swimming pool to sweat off some of the excess the morning after playing a starring role in Limerick’s remarkable All-Ireland triumph. No doubt, what followed over the coming days will never be forgotten, but Sunday’s man-of-the-match takes out his phone and relives the previous 24 hours in his own company before being accosted by the waiting media. To be in this position is something he has been “dreaming about since I was a child” and the Kildimo-Pallaskenry ace has seen everything he had ever hoped for become a reality. Their dreams were very nearly dashed by a last-gasp free from Joe Canning, however. What was he thinking and doing when the Galway sharpshooter was preparing to breaking their hearts? “I was trying to put him off, I was standing in front of him,” Hayes says with a cheeky smile. “It’s bad form but I was praying to God he wouldn’t put it over, if there was any God there I was praying to him! “Obviously with the capability he has you wouldn’t have been surprised if he’d slotted it from that distance out. He was on form in fairness to him. He switched on for about 15 minutes there and it was absolutely ridiculous. Luck had very little to do with it as they dominated the defending champions with the 20-year-old taking All-Star centre-back Gearóid McInerney for four points from play in a colossal individual performance. Not bad for someone who has no problem admitting that centre-back is his favoured position. That sums up this Limerick side though. Egos are left at the door and they all pitch in wherever John Kiely feels they will benefit the squad most. Shane Dowling is another example having been a regular and then forced to be satisfied with a place on the bench and the role of an impact sub. The tightness of the collective always carries the most weight. “The main thing was that we won. I wouldn’t have cared if I hadn’t touched the ball all day as long as we won,” Hayes says. “Last year we were only kind of getting to know each other because there was a lot of new guys on the panel. The third year UL Business student acknowledges that he “might miss a few days of college” when he starts back next month but he has memories to last him a lifetime already. Walking around the hotel with his three-year-old niece Ella on his shoulders is something he’ll never forget, one of many special moments on a memorable weekend along with arriving back on Sunday night as ‘Zombie’ by the Cranberries played them into the Citywest ballroom. The Treaty will be back down to earth next week when club championship kicks back into gear, but they are a driven bunch and don’t plan on letting this be a once-off, although he acknowledges their triumph will give many of the chasing pack hope.